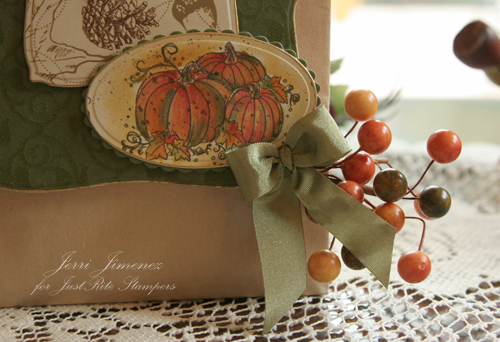 Welcome to Day 2 of the JustRite Stampers Font Blog Hop. JustRite Stampers is celebrating a Mega Font Blog Hop, a two day extravaganza with 54 designers, in style with a Super 7-Day Font Sale. If you’re looking for some fabulous font sets, you won’t want to miss this sale, they are offering 30% off all JustRite font sets and the Horizontal and Vertical font stampers. The sale begins September 17th and ends September 24th. And to add some fun into the blog hop, Mystery Blog Candy is being given away during the Two Day JustRite Font Blog Hop!! Why is it a mystery? . . . Well, there’ll be three blog candy giveaways on each day and you can only win by leaving a comment on the right blog! The real surprise is you won’t know which blog has the candy . . . even the designers don’t know! So, as you visit each of the 54 designers over the two day event, take time to leave a comment . . . You may be one of the lucky winners! You have until 12:00 noon on Sunday to leave comments for your chance to win. You’ll want to check back at the JustRite Blog on Sunday evening to find out if you’ve won. Ladies, go grab a cup of coffee (you’ll want a large cup . . . LOL), a yummy danish, sit back, relax and enjoy the blog hop. I hope we’ve provided you with lots of inspiration for your holiday crafting and decorating! For the designs below I used the above products from JustRite Stampers: Special Occasion Uppercase Font set, Small Letter Font set, Horizontal Wood Stamper set, Autumn Blessings Borders and Centers, and Wood Stamper Oval (large). 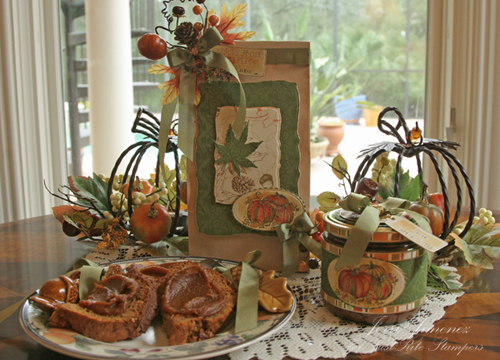 I decorated a jar of Pecan Pumpkin Butter and a bag filled with ingredients to make Spiced Pecan Pumpkin Quick Bread to give away as a Fall holiday gift set. A group picture of the bag, the jar, and the pumkin bread that I baked for my family. Every Fall I receive a loaf of pumpkin bread from a dear friend. She packages it up so beautifully. I’m forever in awe of her thoughtfulness, kindness and talent. This year, I’m giving her this gift set in appreciation for all she does to make me feel special. A close up of the front of the jar. 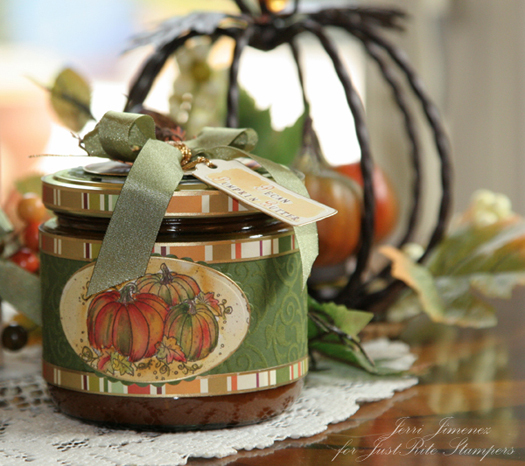 I covered the jar with the Harvest collection designer paper from Me & My Big Ideas, as well as the lid. I used Petite Ovals and Petite Scalloped Ovals nesties for the pumpkin image, a Spellbinders tag die for the tag, and Circles and Scalloped Circles Nesties for the jar lid. The three strips were cut at 1/4″ and wrapped around the jar. I edged the strips, as well as the oval and circle with a gold Krylon pen. The pumpkins were water colored with Stampin’ Up!’ re-inkers. I placed a bow on top of the lid with a tag attached. The bow is made of green taffeta ribbon from May Arts. The leaves were punched with a Martha Stewart leaf punch. The tendrils were made with Chocolate Chip cardstock. I used the Bow Easy to make the bow and encircled it with the gold cord I used for the tag. I made two more taffeta bows and attached them to the butter spreaders, so pretty when you’re having guests. They were very easy to apply, I simply attached them with a Glue Dot close to the ceramic edge. For clean up, simply remove them from the utinsel. I attached another water colored pumpkin panel to the lower corner of the bag and added berries that I purchased at Michael’s. The Michael’s in my area is having a 50% off of all Fall items. I purchased several beautiful pieces for my home as well as a few sprays to use as embellishments for my crafts. The two metal pumpkin tea lights pictured above in the group picture were purchased at Michael’s. So pretty, I can’t wait to light them at the dinner table. 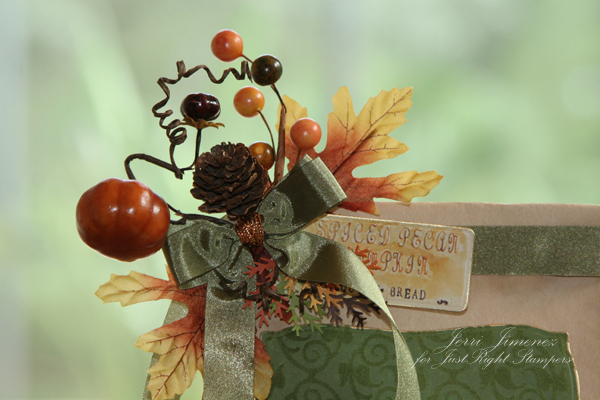 I cut a portion from the Fall spray and adhered it to the bag top, together with a tag that reads, “Spiced Pecan Pumpkin – Quick Bread.” I used bows throughout the project, I’d be lost without the Bow Easy. You’ll want to head on over to Taylor’s blog from here. If I know Taylor, she’ll have something that will knock your socks off! 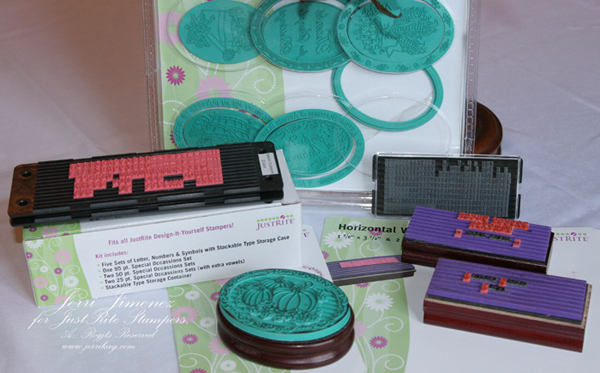 JustRite Stampers for Special Occasion Uppercase Font set, Small Letter Font set, Horizontal Wood Stamper set, Autumn Blessings Borders and Centers, and Wood Stamper Oval (large). 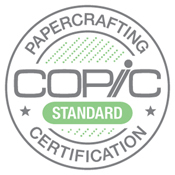 Accessories: Krylon pen, double sided tape, ruler, Scor It, Nestibilities: Petite Ovals, Petite Ovals Scalloped, Circles, Scalloped Circles, Tags, Megabilities, Spellbinders Leaf, Bow Easy, May Arts tafetta ribbon, gold cord (Stampin’ Up! ), Glue Dots, Dimensionals (All Night Media and Stampin’ Up! 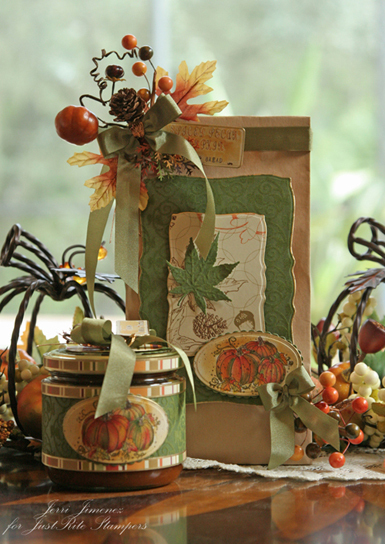 ), Martha Stewart leaf punch, berries and Fall foliage (Michael’s), Zip Dry adhesive, coffee bag, Scotch Removable Tape, Pecan Pumpkin Butter and Spiced Pecan Pumpking Quick Bread (Williams Sonoma). Good Luck with the Blog Candy and enjoy the hop! Thank you for stopping by to visit, I always love to see you here! very nice setting Jerri and it looks yummy too. Oh, Jerri — I am swooning! What a luscious project — what a beautiful table — what gorgeous photos. And, OH, to be able to color like you do — a dream come true would be to sit in your brand new stamp room and get some lessons from you!!! Well, I can dream —- LOL!!! 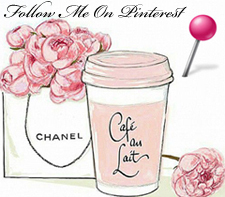 Thank you for such a lovely post over my morning coffee!! This is such thoughtful gift set! It is lovely! You have left me wanting your recipes for pumpkin bread and butter, lol. Oh my goodness Jerri, this is absolutely gorgeous! I love everything about it! Your colors is fabulous and the setting is just beautiful! Every last detail is soooo yummy, Jerri! Your presentation is so elegant, what a treasure for you friend! Take good care! Oh, Jerri, such an incredible set! I just love it! What a clever idea to edge the lid with coordinating paper… I never know what to do with lids! The whole thing looks totally “designer”, totally exquisite. (Never mind that you had to dig through cartons and tear your hair out to get it together — you’d never know it from the pictures!) Thanks for a wonderful idea for a Thanksgiving hostess gift! Such a beautiful gift set. Enjoy your new craft room. What a beautiful gift to receive. I’m sure whoever you give it to will be delighted. Gorgeous! Your friend is fortunate to have you! I can see now how versatile the JR fonts can be. WOW, WOW, WOW!!!! This looks absolutely devine – love the co-ordination and your colouring is incredible!!! Your friend is going to love this gorgeous gift!!! So pretty, your friend will be thrilled to receive this, I’m sure. WoW!!! This set is just stunning! Not one detail overlooked. I love the MS punch you used to decorate the Pecan Pumpkin Butter jar. I gotta order the Special Occasion upper case JR font…it’s so pretty. Do you share your recipes? This set is so pretty! Fantastic job on co-ordinating everything so beautiful. Your table looks so professional like a store window. Great job using JR stamps. Jerri, I know your friend is going to blown away when she opens this wonderfully created essemble, not to speak of the tasty bread and butter! I love how everything is so wonderfully created together and so classy gf! This is beautiful. What a lovely gift set. I love every little detail. It is all so gorgious. Thanks so much for sharing. Absolutely beautiful. You did JustRite proud! 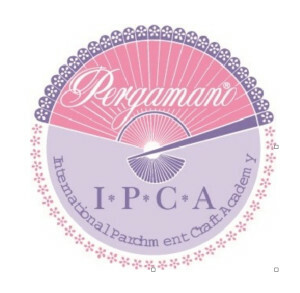 Thank you for sharing all the wonderful projects. beautiful!!! love your project staging! those pumpkins are wonderful!! congrats on your new room too, it is stunning!!!! Your fall gift set is beautiful! Your friend is going to love it. Love your creations! Puts me in the mood for Fall! Great idea for packaging a gift. Love the fall colors. I love to use spellbinders so this idea is right up my alley with the fonts! Thanks for sharing your ideas. Absolutely Beautiful, Your friend will feel so very special when she receives this gift…I really like the use of the fonts on the tags and of course the Pumpkins! Oh my..won’t you be my friend ?? That is GORGEOUS ! Thanks for sharing your creativity with us! Wow,what a fabulous gift. Everything you do is exquisite. Your coloring is fabulous and the presentation is something your friend will absolutely love. Absolutely beautiful! Loved how you used the pumpkins. So pretty and thoughtful! The ensemble looks beautiful together. Even your plate coordinates with your projects. What a beautiful project! I love all the details you put into it! Now I’m hungry! I forgot to grab a yummy danish! LOL! TFS! What a beautiful gift. Your friend will be beside herself to receive something so special! So pretty love how you took the pictures and it also looks mjummie. Really beautiful. Love the colors and the pumpkin bread sounds yummy!! OMG! That was alot of work. It is very beautiful. What a beautiful ensemble Jerri. You always create such lovely pieces. Your attention to detail is wonderful. I really love the way you displayed each piece. I would love to see how you set your Thanksgiving and Christmas dinner tables. You never fail to inspire us. Thanks for sharing. I love everything you do, and this project is no exception. Beautiful. Gorgeous project! Love all the details! Absolutely stunning pieces. thank you so much for sharing them today. I adore these pumpkins! Lovely. Oh my, this is beautiful, thanks for sharing with us! Your elegant touch to everything that you do is really reflected in this gorgeous gift. I love your attention to detail! Also your instructions reflect that same organization. This is a beautiful project. Love your blog. Oh my word!!!!! Absolutely gorgeous and wonderful. Jerri: Thank you for sharing your beautiful projects. I am really inspired to get into the fall decorating. Your friend will love your harvest gifts. I am always amazed at how beautiful you make everything. So lovely and elegant! Wonderful details and colors. I love the way you made the pumpkins not just orange. Oh Jerri, this is a stunning ensemble! And so thoughtful, I think she’ll be blown away. Your coloring on the pumpkins is just yummy! And I WANT some of that pumpkin pecan butter…it looks fabulous! A beautiful arrangement too. Beautiful! The gold Krylon edging really made your pieces pop! 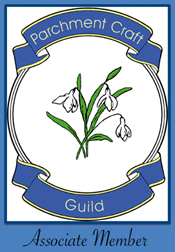 Great project – thanks for sharing! Wow! Great projects, beautiful display! Wow! What a beautiful gift set! The colors are just gorgeous! TFS! Such a beautiful presentation! Makes me want to decorate for fall! Thanks for the inspiration. Great project and a very fun gift for someone!! What a lovely gift! You put so much effort into all the little details and embellishments. It looks to pretty to use! Beautiful gift set. A great idea for hostess gifts now through the ends of the year. Thanks for sharing your gorgeous project! My mouth is watering again. This set is gorgeous and so throughful. I love the Fall pumpkins from the JR set…thanks for inspiring us. What a beautiful gift – I would love to receive it! Thanks so much for sharing! I love the fall colors and you did a gorgeous job! Beautiful! Absolutely Gorgeous. I love the coloring. Can we have the recipe? These are such gorgeous projects! I love how they all coordinate together. What a lucky friend to receive such amazing gift! I like the colors you used. What a beautiful gift jar filled with goodies and a nice matching card. You did a great job! what a gorgeous jar – you’d pay a fortune for something like that in the shops I am sure!! Lovely project – I just ordered this set last night with some font sets – can’t wait for them to arrive so I can play! Absolutely beautiful! But of course, your projects always are. Your friend is one lucky person to receive this wonderful gift. I’m new to visiting your blog. Wow! this gift set you’ve created is really beautiful. Such a beautiful set! Thanks for sharing. What a yummy gift for fall. Thanks for sharing! I love fall and your project pulls together every color, scent and taste that makes it special. Your attention to detail is not overlooked!! Beautiful, warm and welcoming. This gift set is lovely. Your friend is a lucky lady! 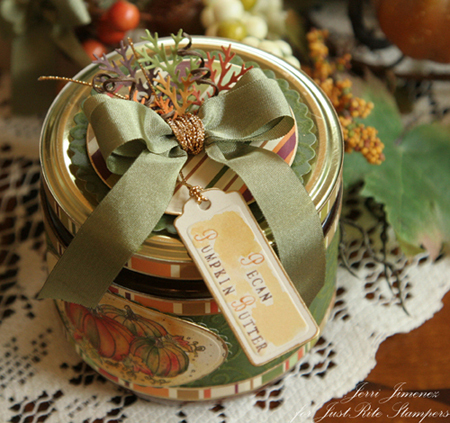 Pecan pumking butter looks so hard to resisit especially with such a beautiful decorated jar. superb!!! This is absolutely stunning. You never fail to amaze me, your attention to detail, how you coordinate sets and your painting ability is fabulous. You are without a doubt the most inspiring artist to me. Thanks for sharing your tremendous talent. such a beautiful gift set. it all looked so yummy. What a beautiful gift Jerri! Im sure your friend will absolutely love it! Thanks for the inspiration, this would make a great hostess gift for my mom for Thanksgiving. Your work always leaves me in awe. This set is absolutely breath taking. you pumpkin butter look delish too. I look forward to your next project. I really think you should post the recipe for the pecan pumpkin butter now that you’ve made us all droll over it! Love how you tie everything together so beautifully. I like how you showed all of the fonts put together on the bases, so we could really see how easy it is to put everything together. Much easier than trying to line up letters on an acrylic block! Pecan pumpkin butter sounds sooo delicious! What a beautiful gift for someone special. I always love visiting your blog because I always know it will be filled with something incredible. love all the super projects you showed with us. What a great fall setup. I love every single detail of your project! Absolutely gorgeous! I love how you colored the pumpkins and the bread and pumpkin spread looks beautiful. What a wonderful ensemble of gifts! Your presentation is outstanding. How lovely the projects and ideas you created. Thanks. Those are so attractive! And what a great Thanksgiving centerpiece! As always absolutely beautiful. Thank you for sharing. Love your pumpkin colors! Just bought this set, but they were out of the block, so now I wait… :(…. What a beautiful gift idea. I like the addition of the spray used as an embellishment. What fantastic projects! The colors are gorgeous. I love seeing everything that has been made so far, and I look forward to checking out all of the other blogs too. You are so creative. I am a big fan of JustRite…there is nothing else like it! That looks too good to give away. Make one set to give away, one to stay, one to give away and etc. I love the touch of green in the pumpkins. Thanks to this set I will be sending autumn cards. Jerri, I don’t know if anyone can top your projects, always so creative and beautiful! that new stamping room has definitely added a new touch to your creativity! What an adorable project! You could resist what’s inside the jar just by looking at how it’s embellished! My jaw dropped when I got further into your blog. Your cards are absolutely works of art. Thank you for inspiring so many. love your decorated bag o’ bread idea. very cute. I love the fall touch to your projects. Great job! I finally had some time to visit! Love all the details in your project…Just lovely! Gorgeous! You are outdone yourself (as usual)… great colors, great projects… love the ribbon and other embellishments. TFS! Can I be invited to your feast?! beautiful gift set – thanks for sharing! How beautiful! Lovely table decor. Having a great time on the hop. Absolutely stunning as usual! I’m ready for you to start lessons! Thanks for sharing! The gift set is BEAUTIFUL! All the details are perfect. And the food look delicious. Oh, that makes me hungry! I am definitely a pumpkin bread lover and yours sound scrumdidilyumptious! Especially with the yummy looking pumpkin butter on top! OHhhhh, I must go and make some! Is there any chance you would share your two recipes? Your work is beautiful. This is just beautiful, looks good enought to eat LOL. Wow what a lucky friend you have! This is beautiful! Would love the recipes! Thanks for sharing. Very beautiful … love everything. This set is absolutely beautiful! Your friend is very lucky to be receiving this. The pumpkin bread and pumpkin butter look delicious too. Yum, Yum. It’s so good to have you back! I’ve missed seeing your gorgeous work. Oh how gorgeous everything looks! Great job! Love the ensemble. I know your friend will love it. God bless! Card and jar are beautiful and looks so good. yummy! WOW! To be the recipient of such a warm and thoughtful gift! I’m sure your friend will LOVE it! It’s all beautiful! Thanks for sharing! Absolutely gorgeous!! Love the colors, added ribbon/berries. What a treat to see! Beautiful. What a wonderful gift. Love the colors that you chose to use and the coloring on the stamps is gorgeous! I’m speechless – your entire ensemble is just fabulous! WOW!! !Ireally love what you created!! Thanks for the wonderful inspiration. Your project is so lovely. I enjoy giving gifts of food and you have taken that gift to a whole other level. Thanks for sharing. Different from your normal style, but truly a beautiful gift set. What a nice gift set! Love it. Your gift set is absolutely beautiful! Other things on your site were fun to look at while I was here – wonderful work! YOUR projects, Jerri, knocked my socks off! WOW! Drop dead gorgeous! What great projects for gifts! Thanks for sharing your creative ideas! Look at you go! When I saw your first photo, I had to go back to read to see if it was your own photo or one from a magazine. I was amazed to read it was your project. Oh my heavens, you did such an outstanding job on the project and the photo. You took such a professional group of photos. Your project is soooooo awesome. I especially liked the wine label for a new home gift! that is so cool how you did the pumpkins on the labels. looks like you can do alot with these stamps. Love your seasonal gift set–thanks for sharing your talent. I knew we were in for a treat when I clicked on the link to your name – what a beautiful gift set. I love how you did the pumpkins and put the name of the pumpkin butter on the tag. Pecan Pumpkin Butter – first time I’ve heard of it and it sounds delicious. Thanks for sharing. This is all so pretty and beautifully done but then I am not surprised. These projects are gorgeous and make a great looking arrangement. I used to make pumpkin butter, maybe I do it this year! Oh such wonderful colors in this creation. Better than Martha! I love every aspect of your project and the table is beautiful. I also hope you’ll share your recipes soon. I’m sure your friend will love this gift set! Your friend will be thrilled to receive this gorgeous and thought gift, Jerri! What a treasure of artwork on the sweet and simple gift of food. Nothing touches the heart of a friend more. Wow, what a project, it’s awesome and totally gorgeous!! Beautiful project! Love how it all comes together. Absolutely gorgeous projects and the staging for the picture is so professional! TFS! Beautiful presentation! I love how your project coordinates with the table decor-looks great! Everything is so perfect and gorgeous. Wonderful project! Oh Jerry, This is such a beautiful table spread! Everything looks delicious, including your card. WOW! Oh Jerri, Your grouping is absolutely beautiful. Such a wonderful idea for someone special. Thank you for sharing it with us. Oh Jeri…everything looks so lovely!!! Your bread looks delicious too! What a wonderful job of showcasing these stamps! Beautiful display and examples of the diversity of JR stamps. LOVE IT! You are the bomb! Everything looks so festive. I love your site. That is just beautiful! The pumpkin butter sounds yummy as well! I can’t tell you how much I live your website you do such wonderful and beautiful things. (Can’t wait to see the next edition of your craft room pics). Your project you have done with the pumpkins is super and I am so envious of your friend who will be getting it. Keep up the good work I need the inspirations. Oh, I am in love with the colour combination you used here! This is just lovely! Your projects are always so elegant and beautiful and the attention to detail is always amazing. Thanks for sharing. This is just gorgeous! I love the colors, the papers, everything. Very artistically put together. I can’t believe this project. It is beautiful and should make anyone happy to receive it. You are so talented. Thanks for sharing. Wow those are so beautiful! Thanks Jerri! What a gorgeous gift set! So many elegant details. You’ve even put a thin strip of paper around the lid to match the jar! LOVE this!! And your photography is stunning, too, Jerri! What a beautiful gift set to give to your friend. Love the stamps you used too on them. Really great idea and thank you for sharing. 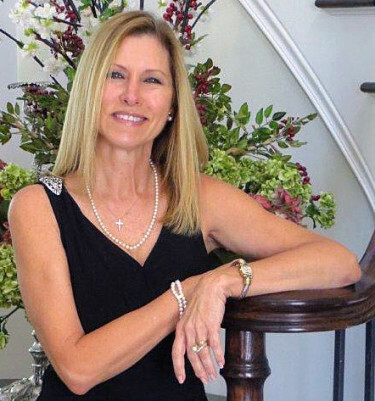 Phyllis M.
Always know that your site will be just great. You always have the most wonderful ideas. I am always happy when I see you have posted. Thanks so much for sharing…. Girl!!! When you go out….you go ALL OUT!!!! Just stunning!!! Everything is absolutely beautiful. You didn’t just stop at decorating the jar. Beautiful results, very elegant. Can I come to your house. Your table is beautiful as well as all your projects. Wow!! Love it!! Thanks for all the inspiration!! Beautiful! We really need thoses recipes…will you share? Oh my gosh, Jerri, your projects are to die for. Really stunning. I got a chuckle out of your letter setup. This is the first time I’ve seen this product and it reminded me of many years ago when I worked for a printer and they used linotype, setting the type much like you did for your lettering. Just like they say, “some techniques never go out of style” they return in a more modern form. 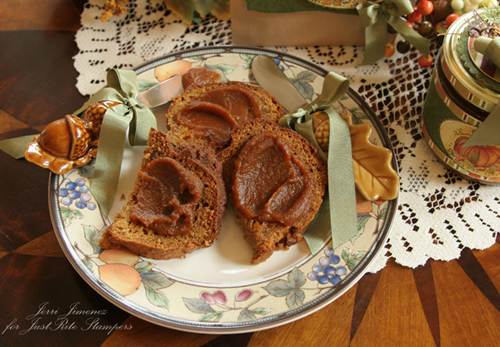 Jeri that pumpkin butter sounds wonderful I make a pumpkin chocolate chip bread that my family just loves. Your combo was done up just beautifully who wouldn’t want a gift like that. Thanks for sharing. I loved your project and got some ideas from you write up. You are wonderfully creative. Thanks for sharing all that you did. Pecan pumpkin butter sounds really good. Maybe posting the reciepe. Love all your projects. It’s really PRETTY!!!!!!!!! These projects are beautiful!! Thanks for sharing another great use for Just Rite Fonts!!!. PS. Peeked at your new craft room and I am “green” with envy. Enjoy it!! What an inviting spread!!! You have staged a great table and enticed my appetite. Love your color combo, tags, pumpkins…you’ve got me sold. Thank you! Love the FALL colors on your beautiful project! Love your beautiful fall projects. Thanks so much for sharing them. P.S. Love your new craft room. I want one just like it. Amazing!!! Your butter looks so good. You must share the recipe with us all, please. The colors in your project are so beautiful. Thanks so much for sharing. These all look so scrummy and beautifully packaged and such lovely colours. The bows are fantastic. I know it must have taken ages to create but it all looks very tranquill !!! tfs. Once again, I am totally in awe of your talent. You blow me away with your stunning work. I just love to look at what you have created. Thank you so much for sharing. Everything looks absolutely incredible, Jerri!! such an absolute gorgeous display, wonderful gift idea! What gorgeous projects!! Thanks for sharing them!! Wow! What fantastic projects you made. Your photography makes everything look amazing. Thanks for the inspiration. I’m just discovering your blog and looking forward to taking a look at more of your creations! Everything is so beautiful – what fabulous ideas – thank you. I just had to tell you what a gorgeous set this is, Jerri….what beautiful colors and so many creative ideas!!!! I love every little detail!!!!! WOW! I’m getting an education on Just Rite Stamps… so much more than I thought! ANy sane person would be in AWE and THRILLED to receive such a gift. Hi Jerri! I didn’t want to join the hop, but I do want to comment on your lovely designs! This is incredible! I don’t know how your art keeps improving, because from the start it has been phenomenal. This looks like a professional magazine spread in Homemakers! This is just amazing, wow. And now, I’m hungry! lol I love the touch of green on the pumpkins.